pardon me, but omfg! i received the most delectable, most divine, most gorgeously, stunningly beautiful parcel EVER last week (or the week before)! what is it, you ask? my book from the pulp redux collaboration! 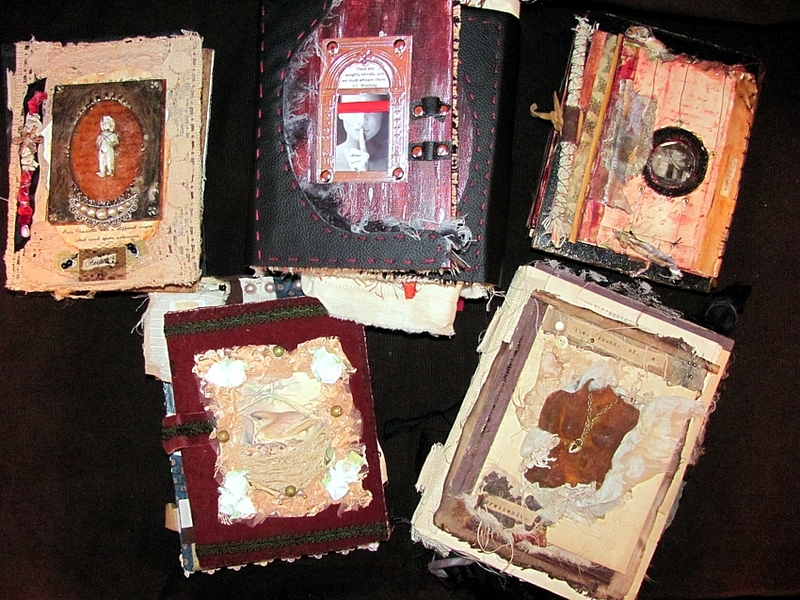 for those who don’t know, the pulp redux collaboration is/was an international handmade/altered book collab with five gals: two from the US (lisa jurist and myself), two from new zealand (debie price-ewen and lisa sarsfield) and one from austrailia (kim palmer). we each started our own books, and each participant created pieces to go into said books in the theme of the originator. to see all of our contributions to date, visit the pulp redux blog. my book’s title is “the museum of forgotten things”. i had had the privilege of seeing all of my completed pages after lisa j. worked her divine magic as she sent it to me so i could post it all to austrailia. so, kim’s contributions were new to me. and omg, she created the most amazing things for my book!! 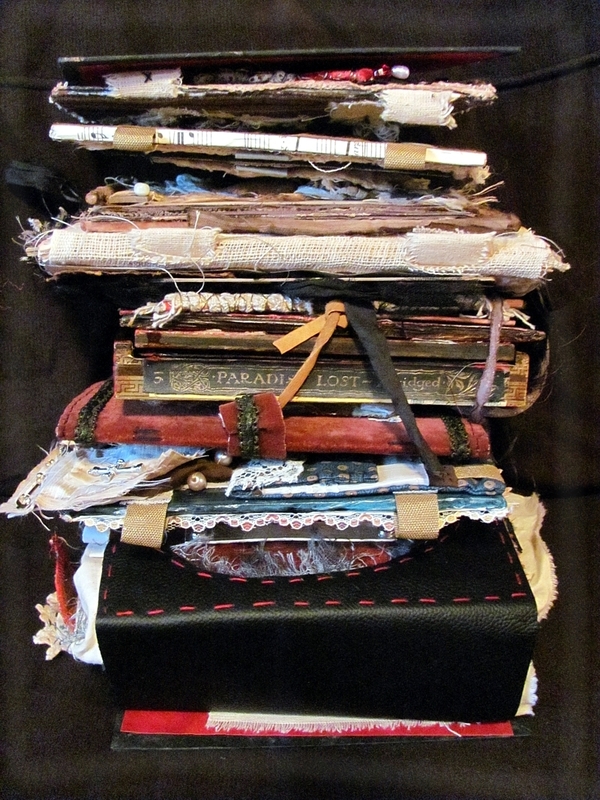 not only is it a book, all bound in gorgeous leather, but it’s a HUGE art quilt when you unfold it! i cannot say or share too much as we’re having an unveiling exhibit in a few months, but i’ll share a peek. in the spirit of stacks (see previous post), i will share this photo first. i took this a mere 7 minutes after the book arrived a couple/few weeks ago and planned to post it all right that very second. initially, we were all going to bind our completed books into one huge book, but this thing is TALL. so, i have decided that although it’s a bit more work, it will be easier to view and enjoy if i bind them in volumes. both deb’s and kim’s are pretty self-contained so i may just bind the other three. then, i shall be getting a 2 foot wall shelf to display them on in my living room — i am so in love with all of the amazing work that has gone into this!! i am slowly but surely finishing lisa j’s book. i’m not trying to go so slow but that is life sometimes… waiting for pieces once i find the perfect “thing” online, etc. i HOPE to send it to her within the next couple of weeks. how many times i’ve said that i do not know, but it will happen before the holidays, that is for dang sure! These are so awesome! I really need to get over myself and start doing some books with you! hells yes you do, lady! get over yourself. 🙂 how fan-flippin-tastic would it be for us to have some joint books! This one is really cool!! Keep on stacking!!! Amazing. Stupendous. Sensational. Fantastic. This collab is/was so exceptional. Congratulations to all of you. And to answer you question, the ‘tallest’ nook I have ever made is 5.5 inches. I just want to dive into, well not literally:), these and absorb all the wonders- such delicious, fabulous photos – wish I could see them in person! I’ve never made a book that’s 12″ tall, for sure, but half that is good! It is making me drool… I can only imagine the wonders inside. Hope to see more soon. OMG! You said it was tall but WOW Alicia!! This is huge! 1 ft!! I can see why you are considering volumes and not one single bound book, It so soooo fab seeing all these pulp pages together, first time for me. Really, really inspiring! Must be flippin fantastic to actually have it in your hands! More stacks, YEAY!!! Your former post is packed with inspiration and so is this one! You have me thinking now, how tall was my biggest/fattest book? I will have to find it and measure it (and convert centimeters into inches…) but you have me curious now! This is my first visit and your blog is amazing. I made a cup of tea and spent ages visiting and am so inspired!!! Came for the stacks, which are marvelous, but this – speechless with awe. A truly beautiful photo of the stacked books, makes me want to have a free afternoon, a cup of tea and be able to peruse them all. Beautiful! I love the fibers and decorations you use in your books! They are really awesome and juicy looking. Beautiful! Thanks for visiting my blog as well! LOVE those books! and the special shelf idea to display them sound super!